MILWAUKEE (AP) — State Sen. Mary Lazich was adamant: The bill Republicans were about to push through the Wisconsin state Senate, requiring that voters present identification at the polls, would do no harm. "Not a single voter in this state will be disenfranchised by the ID law," Lazich promised. By one estimate, 300,000 eligible voters in the state lacked valid photo IDs heading into the election; it is unknown how many people did not vote because they didn't have proper identification. But it is not hard to find the Navy veteran whose out-of-state driver's license did not suffice, or the dying woman whose license had expired, or the recent graduate whose student ID was deficient — or Harris, who at 66 made her way to her polling place despite chronic lung disease and a torn ligament in her knee. She had lost her driver's license just before Election Day. 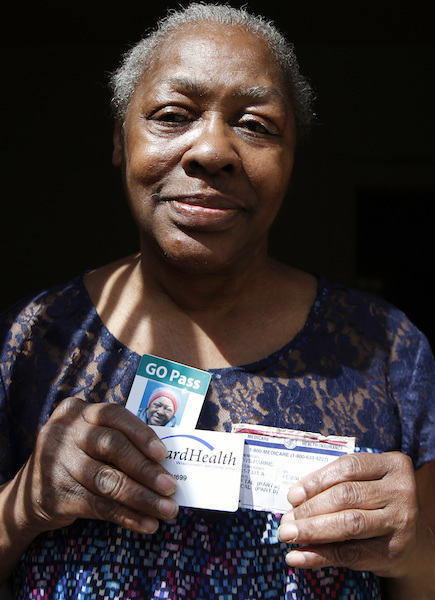 Aware of the new law, she brought her Social Security and Medicare cards as well as a county-issued bus pass that displayed her photo. In the end, Wisconsin's 10 Electoral College votes went to Republican Donald Trump, who defeated Democrat Hillary Clinton by roughly 22,000 votes. But the battle over voter ID laws continues. Under the Wisconsin law, voters must present a driver's license, state ID, passport, military ID, naturalization papers or tribal ID to vote. A student ID is acceptable only if it has a signature and a two-year expiration date. Those who do not have their ID can cast a provisional ballot that will be counted only if they return with the proper ID within a few days of the election. The debate flared anew this week when President Donald Trump signed an executive order creating a commission to investigate voter fraud. Trump maintains, without evidence, that he would have won the popular vote had it not been for millions of people casting ballots illegally. Democrats and voting rights groups said Trump's commission is merely a front for allowing Republican state officials to enact tough registration and voting requirements that would restrict the ability of minorities and the poor to cast ballots. Courts also have weighed in on the topic, upholding laws that are generally narrow in scope while striking down others considered too broad. A federal appeals court last year struck down a package of laws passed in North Carolina, including voter ID, saying they targeted black voters "with almost surgical precision." "They prevented us from voting," she said, simply. When Sean Reynolds went to his polling place at a local ice skating rink on Election Day, he showed his valid driver's license. The problem? It wasn't issued in Wisconsin. Reynolds, 30, was taken aback. He had moved to Madison in 2015 to find work after leaving the Navy and receiving his associate's degree from a university in neighboring Illinois. After learning he could register to vote on Election Day in Wisconsin, he thought all he needed to show at the polls was a current photo ID. After all, his Illinois ID was good enough to board a plane, open a checking account and purchase cold medicine. "Coming home and being denied the right to vote because I didn't have a specific driver's license is very frustrating," said Reynolds, who served in both Iraq and Afghanistan providing support for special forces. "I was a little incredulous that they wouldn't accept another state's driver's license. I didn't understand why it was not a valid form of ID." Supporters of voter ID laws say that prohibiting out-of-state driver's licenses reduces the possibility of voter fraud and individuals filling out multiple ballots. Research has shown that such voter fraud can happen, but it's very rare. After casting a provisional ballot, Reynolds was told to return within three days with a Wisconsin driver's license, but he couldn't take the time off from work on such short notice. "I only had between Tuesday and Friday to get it done, and I just couldn't accomplish it in that time frame," he said. When Alvin Mueller retired from his job as a maintenance worker, his wife Margie, 85, quit driving and let her license expire in 2010. The couple never had trouble voting in Plymouth, a small city about an hour's drive north of Milwaukee where they've lived since they married 65 years ago. But they hit a snag during early voting in November because Margie Mueller couldn't cast a ballot with her expired license. The staff at the city clerk's office said if she wanted to vote, she would need to get a new ID at a DMV office about 15 miles away in Sheboygan, the county seat, Alvin Mueller recalls. That's not unusual. The Brennan Center estimated that in the 10 states with voter ID laws in 2012, more than 10 million eligible voters lived more than 10 miles from a state ID-issuing office that is open more than two days a week. Alvin Mueller said his wife was battling cancer in her lymph nodes and lungs. The prospect of making the trip to Sheboygan was overwhelming. Not only did they not make the drive — Alvin decided if his wife couldn't vote, he wouldn't either. It's not like they were strangers to the poll workers: "We voted in Plymouth here for years. They know us and everything," he said. "I'm going to be 86 pretty soon," he said. "I don't think I'll be voting anymore, as long as she isn't here. We did everything together." Tindall, 24, had graduated in May, but wasn't sure whether she would stay in Wisconsin so she kept her Ohio ID. Her student ID had her name, photo, a barcode, school logo and the most recent academic year she attended. But her student ID didn't have an expiration date or say when it was issued, so she was forced to cast a provisional ballot. She doesn't have a car, so she took an Uber to the DMV to get an ID. She was told the ID would arrive by express mail the next day. By then, she said, her work schedule at a Starbucks prevented her from going to the local clerk's office with the ID so her vote would count. "At the time I was thinking, 'At least tried, so I can't feel too bad about it,'" she said. "When I would see people saying, 'What's wrong with you Wisconsin, what are you doing?' I would feel like, 'Oh my God, I'm part of the problem,'" Tindall said. Overall, nearly 3 million people in Wisconsin voted last November, about 91,000 fewer than in 2012. Milwaukee, a power center for Democrats, reported that 41,000 fewer people voted there than in 2012; lack of enthusiasm for the candidates may have played a role. Backers of the ID law say it was a success. The number of provisional ballots, issued to voters who are unable to provide the required documentation, represented a fraction of all ballots cast — less than one half of 1 percent, according to a report by the Wisconsin Election Commission. Election officials are currently reviewing 86 reports of possible voter fraud, of which 70 involved felons who may have voted before having their rights restored. Gov. Scott Walker was a major supporter of voter ID. He said recently that voter education is important to him and all elected officials. "In a society where just about everyone has some form of voter identification, we just need to make sure going forward that we provide it for free, (that) we provide easy access to documents and other things in that regard," Walker said. "We can be more than capable of making sure that people all across the state have access to voter identification." A former U.S. senator from the state, Democrat Russ Feingold, called voter ID laws "scams" from Republicans who know "the Democratic Party has the numbers to decisively win every presidential election and a majority of Senate seats." Feingold was ousted in 2010 by Republican Ron Johnson and was defeated again in a rematch last year. The former senator recently launched LegitAction, a nonprofit advocacy group that advocates for voting rights and abolishing the Electoral College. "The sole purpose of these laws, including those passed in Wisconsin, is to keep eligible voters from voting, specifically minority and low-income voters who tend to vote Democrat," Feingold said in a statement to The Associated Press. Gladys Harris believes the state law did precisely what she thinks it was intended to do — prevent blacks like her who don't have a car and rely on public transportation from voting. For the last two decades, she has lived and voted in Wisconsin. Retired from her job working at an HIV/AIDS community resource center, she no longer drives and relies on public transit and friends to bring her to doctor's appointments, the grocery store — and the voting booth. "Even though they say your vote doesn't count, I feel like it does," Harris said. "There is no understanding this. It was unfair, and I think it was cruel," Harris said. A few days after the election, Harris found her driver's license. It had fallen between her mattress and headboard. Cassidy reported from Atlanta. Follow her on Twitter at http://twitter.com/AP_Christina and Moreno at https://twitter.com/Ivanjourno .